The National Transportation Safety Board’s investigation found that the rupture of Line 132 was caused by a fracture that originated in the partially welded longitudinal seam of one of six short pipe sections, which are known in the industry as “pups.” The fabrication of five of the pups in 1956 would not have met generally accepted industry quality control and welding standards then in effect, indicating that those standards were either overlooked or ignored. The weld defect in the failed pup would have been visible when it was installed. The investigation also determined that a sewer line installation in 2008 near the rupture did not damage the defective pipe. The rupture occurred at 6:11 p.m.; almost immediately, the escaping gas from the ruptured pipe ignited and created an inferno. The first 911 call was received within seconds. Officers from the San Bruno Police Department arrived on scene about 6:12 p.m. Firefighters at the San Bruno Fire Department heard and saw the explosion from their station, which was about 300 yards from the rupture site. Firefighters were on scene about 6:13 p.m. More than 900 emergency responders from the city of San Bruno and surrounding jurisdictions executed a coordinated emergency response, which included defensive operations, search and evacuation, and medical operations. Once the flow of natural gas was interrupted, firefighting operations continued for 2 days. Hence, the emergency response by the city of San Bruno was prompt and appropriate. However, PG&E took 95 minutes to stop the flow of gas and to isolate the rupture site—a response time that was excessively long and contributed to the extent and severity of property damage and increased the life-threatening risks to the residents and emergency responders. The National Transportation Safety Board found that PG&E lacks a detailed and comprehensive procedure for responding to large-scale emergencies such as a transmission pipeline break, including a defined command structure that clearly assigns a single point of leadership and allocates specific duties to supervisory control and data acquisition staff and other involved employees. PG&E’s supervisory control and data acquisition system limitations caused delays in pinpointing the location of the break. The use of either automatic shutoff valves or remote control valves would have reduced the amount of time taken to stop the flow of gas. • Was based on incomplete and inaccurate pipeline information. • Did not consider the design and materials contribution to the risk of a pipeline failure. • Failed to consider the presence of previously identified welded seam cracks as part of its risk assessment. • Resulted in the selection of an examination method that could not detect welded seam defects. • Led to internal assessments of the program that were superficial and resulted in no improvements. Several deficiencies revealed by the National Transportation Safety Board investigation, such as PG&E’s poor quality control during the pipe installation and inadequate emergency response, were factors in the 2008 explosion of a PG&E gas pipeline in Rancho Cordova, California. 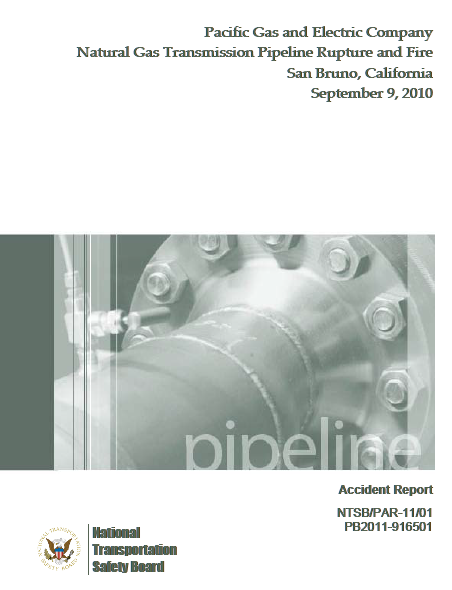 (See Explosion, Release, and Ignition of Natural Gas, Rancho Cordova, California, December 24, 2008, Pipeline Accident Brief NTSB/PAB-10/01 [Washington, DC: National Transportation Safety Board, 2010].) This 2008 accident involved the inappropriate installation of a pipe that was not intended for operational use and did not meet applicable pipe specifications. PG&E’s response to that event was inadequate; PG&E initially dispatched an unqualified person to the emergency, causing an unnecessary delay in dispatching a properly trained and equipped technician. Some of these deficiencies were also factors in the 1981 PG&E gas pipeline leak in San Francisco, which involved inaccurate record-keeping, the dispatch of first responders who were not trained or equipped to close valves, and unacceptable delays in shutting down the pipeline. (See Pacific Gas & Electric Company Natural Gas Pipeline Puncture, San Francisco, California, August 25, 1981, Pipeline Accident Report NTSB/PAR-82/01 [Washington, DC: National Transportation Safety Board, 1982].) The National Transportation Safety Board concluded that PG&E’s multiple, recurring deficiencies are evidence of a systemic problem. The investigation also determined that the California Public Utilities Commission, the pipeline safety regulator within the state of California, failed to detect the inadequacies in PG&E’s integrity management program and that the Pipeline and Hazardous Materials Safety Administration integrity management inspection protocols need improvement. Because the Pipeline and Hazardous Materials Safety Administration has not incorporated the use of effective and meaningful metrics as part of its guidance for performance-based management pipeline safety programs, its oversight of state public utility commissions regulating gas transmission and hazardous liquid pipelines could be improved. Without effective and meaningful metrics in performance-based pipeline safety management programs, neither PG&E nor the California Public Utilities Commission was able to effectively evaluate or assess PG&E’s pipeline system.